ESA’s Rosetta – and her companion spacecraft – Philae – parted ways on Wednesday, ahead of a historic landing on the surface of Comet 67P/Churyumov-Gerasimenko. 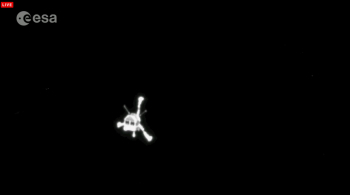 Philae conducted the journey towards the landing site named Agilkia, bounced at least twice, before coming to rest in a location that should still provide the lander and opportunity to conduct the first-of-it-kind science on a comet. The Rosetta mission began atop of an Ariane 5G rocket, launched from Europe’s Spaceport in Kourou on March 2, 2004. 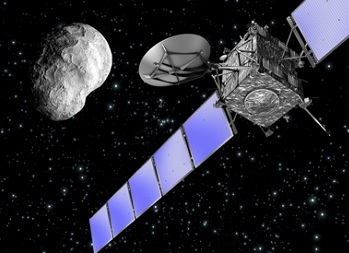 This ESA-led mission is the first designed to orbit and land on a comet. It consists of an orbiter, carrying 11 science experiments, and a lander, called ‘Philae’, carrying 10 additional instruments, for the most detailed study of a comet ever attempted. Travelling a distance of 800 million kilometres (500 million miles) from the Sun, the spacecraft took in an orbit of Jupiter, passing by Earth three times and Mars once, while also flying past two asteroids. In June of 2011, Rosetta was switched to its hibernation mode, protecting its vital payloads from the coldness of deep space. The spacecraft were then awoken from their slumber, with the help of a superb “Wake up Rosetta”public outreach campaign by ESA – along with the creation of highly acclaimed cartoon animations involving the spacecraft by designdata.de. The duo finally arrived at Comet 67P/Churyumov-Gerasimenko in the summer – catching up with the heavenly body as it moves farther into the inner reaches of our Solar System. Rosetta conducted a final burn, ahead of a 22 minute wait for the telemetry to travel back to Earth, to confirm the required rendezvous procedures. The focus was then firmly placed on Philae, ahead of parting ways with Rosetta and heading for the surface of the comet. With Philae now successfully completing the landing phase, it will obtain the first images ever taken on the surface of a comet and it will make the first in-situ analysis of the composition by drilling into the surface. Philae is only the second human-made object to land on a cosmic body far from Earth. It will follow the Huygens probe that landed on Saturn’s moon Titan, 1.3 billion kilometers from Earth, in January 2005. However, Rosetta is the first spacecraft to witness, at close proximity, how a comet changes as it is subjected to the increasing intensity of the Sun’s radiation. The landing site – previously known as “Site J” via the selection process conducted after Rosetta took an array of imagery of the comet – is named for Agilkia Island, an island on the Nile River in the south of Egypt. Procedures for the historic landing began with the commands uploaded to the spacecraft, along with efforts to warm up the lander. With Rosetta making a planned low orbit around the comet, the path was chosen that allowed for the release of Philae at 08:35 GMT on Wednesday. This was followed by “seven hours of terror” – a play on NASA’s Curiosity landing – as the lander made the journey to the landing site. The events began overnight with several Go/No Go decisions for the landing attempt. 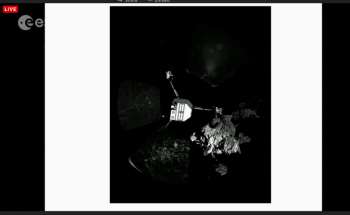 Despite a few “hiccups”, the procedures finally resulted in the separation of Philae from Rosetta. Confirmation of this – and all of the major events – took around 30 minutes to reach Earth, by which time Philae was making transitions in the post delivery phase. Radio contact – following the expected Loss Of Signal post-sep – occurred around 10:30 GMT, ahead of the first telemetry data from the spacecraft around Noon. There was then an anxious wait as Philae continues towards the comet. Confirmation of the historic landing arrived back on Earth around 16:03 GMT. The actual landing took place at 15:35 GMT. There was a short wait while telemetry confirmed the lander had not bounced off the surface, a concern after the cold gas thruster system was classed as down ahead of the landing. Cheers confirmed all was thought to have gone to plan. However, it was later revealed the anchors had not fired, than Philae had bounced back up as far as a kilometer, before returning to a new location on the comet, bouncing one more time, prior to then coming to rest on the surface. It is believed the lander has come to rest with one leg in the air. There is still potential the lander can be transitioned to a better attitude on the surface, but hopes are high science can still be conducted in this configuration. 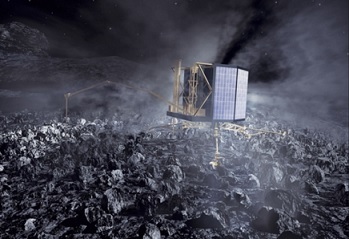 Philae is tasked with transmitting data from the surface about the comet’s composition, with the focus on elemental, isotopic, molecular and mineralogical composition of the cometary material, along with the the characterization of physical properties of the surface and subsurface material, the large-scale structure and the magnetic and plasma environment of the nucleus. “Rosetta is trying to answer the very big questions about the history of our Solar System. What were the conditions like at its infancy and how did it evolve? What role did comets play in this evolution? How do comets work?” added Matt Taylor, ESA Rosetta project scientist. However, this exciting science mission is at the mercy of a successful soft landing, the first of its kind.